Today I want to talk about JWST, so with that name will not sound, nor with the James Webb Space Telescope, which, even expanding the letters ye shall have stayed the same. We know that an optical telescope orbiting the Earth for many years, Hubble. You also know that the poor, since “eliminated” space shuttle has been neither repaired or expanded. This telescope has since 1990 giving excellent images that have helped not only people (poor) to remain amazed by what’s up there, but given very important information about cosmological phenomena. But since 2009 leads not touching, surpassing its life in many years. 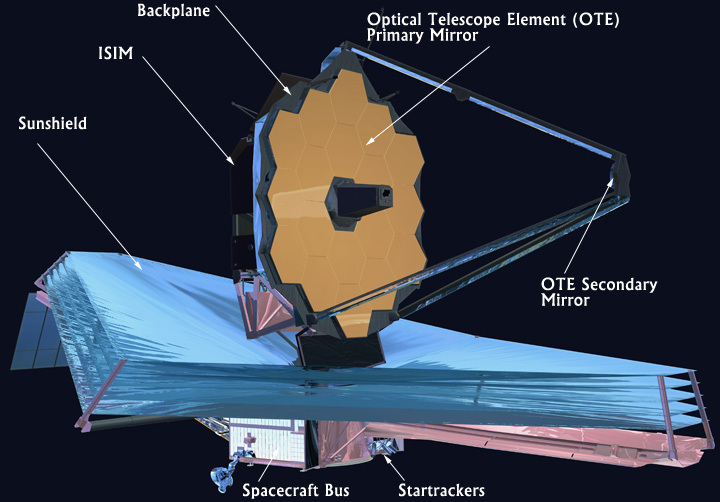 The JWST will be his replacement and was launched in 2018. In principle there will be an optical telescope because, on Earth we have enough and the Hubble, will still be there, so it is somewhat better, an infrared telescope, as you know and I have explained, is not affected by things like cosmic dust as it detects a “richer” electromagnetic frequency. Thus while outside our atmosphere complete the data obtained from optical telescopes with much richer signals. One of the advantages, now that it has become fashionable that there is a planet that can hold water in Proxima Centauri, is that with this telescope so fine you can collect information from the atmosphere when the planet passes in front of its star through the this thin layer and light (radiation) to pass by from the star. With the current media can be measured, but existing interference by Earth’s atmosphere can contaminate data, which does not pass the JWST. In addition, if you remember when you talk about the background radiation, its importance and what he has discovered us the origin of our universe and the Big Bang, this telescope can add information to power by measuring infrared low intensity take samples of stars and galaxies very old and therefore, closer to the Big Bang as a proxy check existing simulations. That is, radiation simulations have been performed as has been the progress and nucleation of galaxies mode, if we get the calculations right, to give “reverse” and go back in time to much earlier times. The fact is that simulations as good simulations are not known if they are well done or tuned. With this telescope show what we can see if “we are doing well” in the calculations and, as I said, pulling back “t” things will get better reflect reality. And just I told roll. I recommend you see the website of the NASA where they have these things better than I.